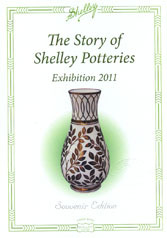 Produced to complement The Shelley Group 25th Anniversary Exhibition, this booklet is in two parts. The first half gives a wealth of detail on the factory, its history and people, while the second half is a tour around the 21 cabinets of china and earthenware and introducing the various display themes. The booklet, which contains 18 pages, is a reproduction of the storyboards displayed at the exhibition. It is approximately 147 x 210 mm (5¾ x 8¼ inches) in size.